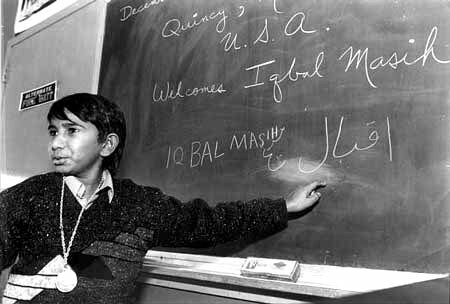 Iqbal Masih was born in Muridke, Pakistan. He lived his young life, unfortunately as a child laborer, which began when he was just 4 years old. He lived in Pakistan with his family who needed money to pay for their eldest son’s wedding, so they borrowed 600 rupees (around $12) from a carpet factory owner who was rich and influential in their community. They exchanged their son, Iqbal, for the money. The factory owner would not release Iqbal until the debt was paid; unfortunately the family could not afford to buy back their son. The owner always had the option to sell the boy or any of the other children to another factory owner if he so desired. Iqbal and several other children were forced to squat before loom and weave carpet in the factory. These special carpets were sold on the world market for high prices. He worked 12 hours a day, 6 days a week. He could not make mistakes or else the owner would add fines to the sum of what his parents owed. There was always the threat of the children getting a beating, or being hung by their legs for punishment in a back room. Many of them had visible scars on their hands and their feet from being whipped or struck with sharp metal tools or sticks because they had fallen asleep while at the loom. Many times, the children would accidentally cut themselves with the carpet knives and, to stop the bleeding, their wounds were dipped in hot oil, or matchstick powder would be put in their cuts by the foreman who lit them up so that the blood and skin would quickly bond together. Their main concern was getting the children back to work quickly. At the age of 10, Iqbal knew he would remain indebted and enslaved to the carpet owner forever seeing that he would never have the money needed to pay off his family’s debt. The sum of the debt had reached 13,000 rupees, which had increased due to the charges for his lunch that he ate each day, a bowl of rice, and also fines for mistakes. 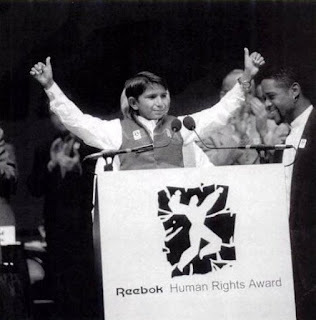 In 1994, at 12 years old, he traveled as a spokesperson for the BLLF throughout Europe and the U.S. speaking to children who were the same age as him about what he had went through as a child slave. 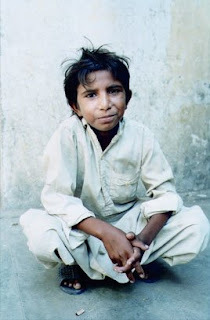 He called for a boycott of the carpet industry in Pakistan and an end to child labor. Later, that same year, he received the Reebok Human Rights Youth In Action Award in Boston. He had a carpet tool in one hand and a pencil in the other, standing in front of the audience, he began to speak of child labor and the horrors of it. “We are…..” he said, filling the room with his voice. “We are…..” he said again. “Free!” the audience shouted again in-kind. Iqbal helped thousands of children that were in bonded labor get released, which caused the Pakistani carpet industry to begin to wane. They had lost a lot of money from him speaking out. 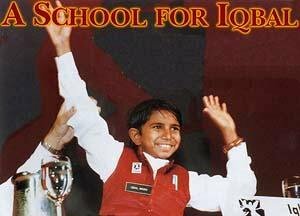 On April 16, 1995, on Easter Sunday, Iqbal was murdered in his native village while riding a bicycle. He was only 12-years old. 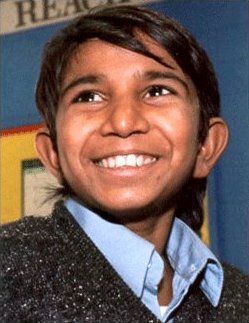 Iqbal’s story had made such an impression on the students at Broad Meadows Middle School that they decided to take the anger over his murder and turn it into positive action, so they decided to raise money to build a school in Pakistan because they said that that was his dream. Amanda Loo, a 13-year old student there, co-founded, with her classmates, “A School for Iqbal,” and in 1996, they eventually raised $150,000 and built a 5-room schoolhouse that would also be used as a community health center in Kasur, Pakistan, near Iqbal’s hometown. Broad Meadows Middle School students testify before Congressional Roundtable on Youth Activism in Washington, D.C. At the microphone is Meagan Donoghue, 8th grade. From left are USAID administrator Brian Atwood; Democratic Congressman William Delahunt, of Maryland; Katie Sault, 7th grade, and Elizabeth Bloomer, 7th grade. 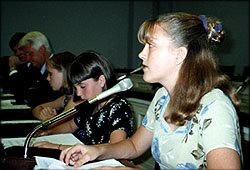 Amanda and other classmates testified before Congress shortly before the schoolhouse was finished about what she had learned of child laborers. 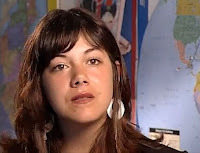 Amanda also joined an international cause, Global March Against Child Labour, was flown by the garment-workers union, UNITE, to Geneva Switzerland, where she gave a speech against child labor. as well as other related videos. 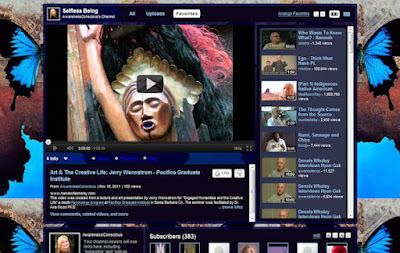 This video was created from a lecture and art presentation by Jerry Wennstrom for "Engaged Humanities and the Creative Life" a depth Psychology program at Pacifica Graduate Institute in Santa Barbara CA. The seminar was facilitated by Dr. Ana Mozol Ph.D. In this video Jerry shares his unusual personal story, insights and photographs of the large body of art that he created throughout his lifetime. It is an intimate and in-depth guided tour of the creative journey and psychological process of an artist. Jerry articulates his quest, not just for creative inspiration but also for that "quantum leap" that sets one on the path of an inspired life. Paradoxically most of the paintings shown here were destroyed by the artist in 1979 and as stated in the video transformed into a more complete and whole way of Being. The sculptures presented here are only part of the entirely new body of art that has emerged. The ethics of the Hindus is subtle, sublime and profound. All religions have taught ethical precepts such as: “Do not kill, do not injure others, love your neighbor as yourself,” but they have not given the reason. The basis of Hindu ethics is this: “There is one all-pervading Atman. It is the innermost soul of all beings. This is the common, pure consciousness. If you injure your neighbor, you really injure yourself. If you injure any other creature, you really injure yourself, because the whole world is nothing but your own Self.” This is Hindu ethics. This is the basic metaphysical truth that underlies all Hindu ethical codes. The Atman or Self is one. One life vibrates in all beings. Life is common in animals, birds and human beings. Existence is common. 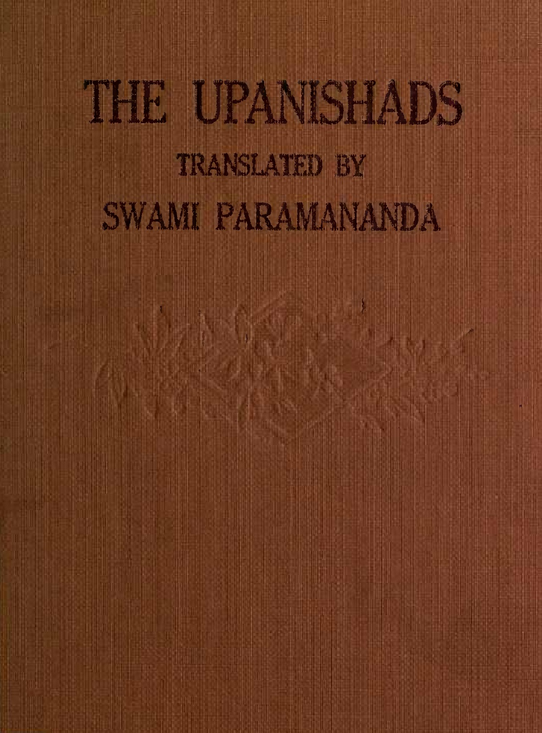 This is the emphatic declaration of the Upanishads or Srutis. This primary truth of religion is the foundation of ethics or morality or science of right conduct. Morality has Vedanta as its basis. The first thing you learn from religion is the unity of all selves. The Upanishads says: “The neighbor is, in truth, the very Self and what separates you from him is mere illusion.” One Atman or Self abides in all beings. Universal love is the expression of the unity. Universal brotherhood has its basis in the unity of Self. All human relations exist because of this unity. Yajnavalkya said to his wife Maitreyi: “Behold, my dear, not indeed for the love of the husband is the husband dear, for the love of the Self is the husband dear.” And so with wife, sons, property, friends, worlds and even the Devas themselves, All Are Dear, because the one Self is in all. If you injure another man, you injure yourself. If you help another person, you help yourself. There is one life, one common consciousness in all beings. This is the foundation of right conduct. This is the foundation of ethics. Sridhar Rao, as Swami Chidananda (9/24/1916 - 8/28/2008) was known before taking Sannyasa (embracing a life of renunciation), was born to Srinivasa Rao and Sarojini, on the 24th September, 1916, the second of five children and the eldest son. Sri Srinivasa Rao was a prosperous Zamindar (a rich landlord) owning several villages, extensive lands and palatial buildings in South India. Sarojini was an ideal Indian mother, noted for her saintliness. At the age of eight, Sridhar Rao's life was influenced by one Sri Anantayya, a friend of his grandfather, who used to relate to him stories from the epics, Ramayana and Mahabharata. Doing Tapas (austerities), becoming a Rishi (sage), and having a vision of the Lord became ideals which he cherished. His uncle, Krishna Rao, shielded him against the evil influences of the materialistic world around him, and sowed in him the seeds of the Nivritti life (life of renunciation) which he joyously nurtured until, as latter events proved, it blossomed into sainthood. Service to lepers became his ideal. He would build them huts on the vast lawns of his home and look after them as though they were deities. Later, after he joined the Ashram (hermitage), this early trait found in him complete and free expression where even the best among men would seldom venture into this great realm of divine love, based upon the supreme wisdom that all are one in God. Patients from the neighbourhood, suffering from the worst kind of diseases came to him. Service, especially of the sick, often brought out the fact that he had no idea of his own separate existence as an individual. It seemed as if his body clung loosely to his soul. The final decision came in 1943. He was already in correspondence with Sri Swami Sivanandaji Maharaj of Rishikesh. He obtained Swamiji's permission to join the Ashram. Towards the end of 1948, Gurudev nominated him as the General Secretary of The Divine Life Society. The great responsibility of the organization fell on his shoulders. From that very moment he spiritualized all his activities by his presence, counsel and wise leadership. He exhorted all to raise their consciousness to the level of the Divine. On Guru Purnima day, the 10th of July, 1949, he was initiated into the holy order of Sannyasa by Sri Swami Sivanandaji Maharaj. He now became known as Swami Chidananda, a name which connotes : "one who is in the highest consciousness and bliss." In August 1963, after the Mahasamadhi of the Master, he was elected as President of the Divine Life Society. 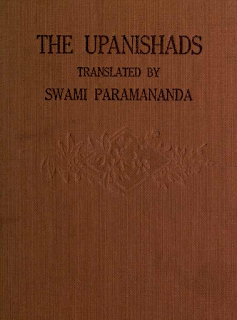 After election, he strove to hold aloft the banner of renunciation, dedicated service, love and spiritual idealism, not only within the set-up of the widespread organization of the Society, but in the hearts of countless seekers throughout the world, who were all too eager to seek his advice, help and guidance. Speaker Bio: Matthieu Ricard, a gifted scientist turned Buddhist monk, is a bestselling author, translator, and photographer. He has lived and studied in the Himalayas for the past 35 years. grief, when he sees this oneness (everywhere)? "How to get firm in this?" is it firm or not firm? Inquire into this, who is firm and not firm? Who is asking this question? and this question will die in front of you. Through Meditation We Can Come To See That The Only Thing That Makes Us Suffer Is Our Own Mind. The task of any useful spiritual practice is therefore to dismantle cherishing the thoughts, opinions, and ideas that make up the false self, the self that is seeking. This is the true task of both meditation and inquiry. Through meditation we can come to see that the only thing that makes us suffer is our own mind. 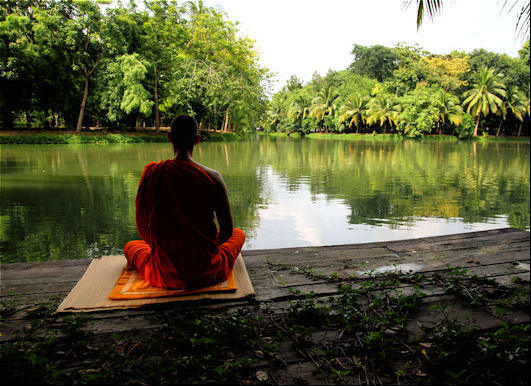 Sitting quietly reveals the mind to be nothing but conditioned thinking spontaneously arising within awareness. Through cherishing this thinking, through taking it to be real and relevant, we create internal images of self and others and the world. Then we live in these images as if they were real. To be caught within these images is to live in an illusory virtual reality. Through observing the illusory nature of thought without resisting it, we can begin to question and inquire into the underlying belief structures that support it. These belief structures are what form our emotional attachments to the false self and the world our minds create. This is why I sometimes ask people, “Are you ready to lose your world?” Because true awakening will not fit into the world as you imagine it or the self you imagine yourself to be. Reality is not something that you integrate into your personal view of things. Reality is life without your distorting stories, ideas, and beliefs. It is perfect unity free of all reference points, with nowhere to stand and nothing to grab hold of. It has never been spoken, never been written, never been imagined. It is not hidden, but in plain view. Cease to cherish opinions and it stands before your very eyes. "Sailor" Bob Adamson speaking about non-duality. pointed to the reality, the actuality THAT I AM. Now I abide as THAT." Who Wants To Know What? ever interview. Conducted by Advaita Fellowship co-founder Rifka Hirsch. A commerce graduate from the University of London, Ramesh S. Balsekar worked as the General Manager of a leading nationalized Bank and retired as its President in 1977. Even during his working life, he always felt he was enacting some role in a play that must, and would, end soon. Deep within, he believed that there had to be more to life than merely getting ahead of the other man. What was he seeking? The answer came soon after his retirement when he had an encounter, which soon led to daily meetings, with the well-known sage, and his Guru, Sri Nisargadatta Maharaj. The total understanding that 'no one does anything' happened in 1979. Ramesh began translating many of the daily talks held by Nisargadatta Maharaj. Recognized as one of the foremost contemporary sages and considered a Master of pure Advaita around the world, Ramesh, who was married and a father of three children, was widely regarded as a 'householder' Guru. He elaborated his own concepts with those of his Guru Nisargadatta Maharaj, the Buddha, Ramana Maharshi, selected Hindu scriptures as well as the teachings of Taoist Masters and Wei Wui Wei. All serve as pointers to the Truth - The Ultimate Understanding. There are thousands of teachings of "doing and becoming"
which can keep the seeker on the hamster wheel forever. There is much difference between awareness and witnessing. Witnessing is still an act; you are doing it; the ego is there. So the phenomenon of witnessing is divided between the subject and the object. Witnessing is a relationship between subject and object. Awareness is absolutely devoid of any subjectivity or objectivity. There is no one who is witnessing in awareness; there is no one who is being witnessed. Awareness is a total act, integrated; the subject and the object are not related in it; they are dissolved. So awareness doesn't mean that anyone is aware; nor does it mean that anything is being attended to. Awareness is total – total subjectivity and total objectivity as a single phenomenon – while in witnessing a duality exists between subject and object. Awareness is nondoing; witnessing implies a doer. But through witnessing awareness is possible, because witnessing means that it is a conscious act; it is an act, but conscious. You can do something and be unconscious – our ordinary activity is unconscious activity – but if you become conscious in it, it becomes witnessing. So from ordinary unconscious activity to awareness there is a gap that can be filled by witnessing. Witnessing is a technique, a method toward awareness. It is not awareness but, compared to ordinary activity, unconscious activity, it is a higher step. Something has changed: activity has become conscious, unconsciousness has been replaced by consciousness. But something more still has to be changed. That is, the activity has to be replaced by inactivity. That will be the second step. It is difficult to jump from ordinary, unconscious action into awareness. It is possible but arduous, so a step in between is helpful. If one begins by witnessing conscious activity, then the jump becomes easier – the jump into awareness without any conscious object, without any conscious subject, without any conscious activity at all. This doesn't mean that awareness isn't consciousness; it is pure consciousness, but no one is conscious about it. There is a further difference between consciousness and awareness. Consciousness is a quality of your mind, but it is not your total mind. Your mind can be both conscious and unconscious; but when you transcend your mind, there is no unconsciousness and no corresponding consciousness. There is awareness. 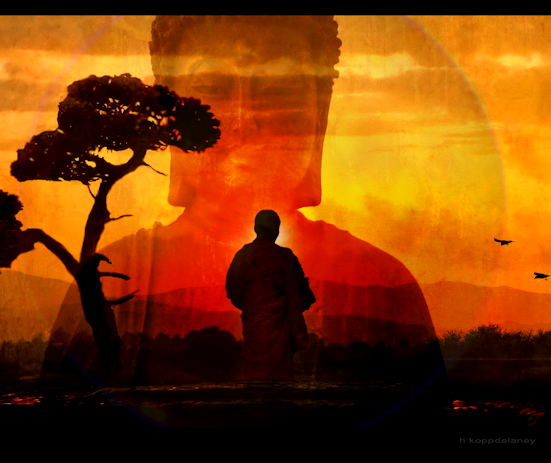 Awareness means that the total mind has become aware. Now the old mind is not there but there is the quality of being conscious. Awareness has become the totality; the mind itself is now part of the awareness. We cannot say that the mind is aware; we can only meaningfully say that the mind is conscious. Awareness means transcendence of the mind, so it is not the mind that is aware. It is only through transcendence of the mind, through going beyond mind, that awareness becomes possible. Consciousness is a quality of the mind, awareness is the transcendence; it is going beyond the mind. Mind, as such, is the medium of duality, so consciousness can never transcend duality. It is always conscious of something, and there is always someone who is conscious. So consciousness is part and parcel of the mind, and mind, as such, is the source of all duality, of all divisions – whether they are between subject and object, activity or inactivity, consciousness or unconsciousness. Every type of duality is mental. Awareness is nondual, so awareness means the state of no mind. Then what is the relationship between consciousness and witnessing? Witnessing is a state, and consciousness is a means toward witnessing. If you begin to be conscious, you achieve witnessing. If you begin to be conscious of your acts, conscious of your day-to-day happenings, conscious of everything that surrounds you, then you begin to witness. Witnessing comes as a consequence of consciousness. You cannot practice witnessing; you can only practice consciousness. Witnessing comes as a consequence, as a shadow, as a result, as a byproduct. The more you become conscious, the more you go into witnessing, the more you come to be a witness. So consciousness is a method to achieve witnessing. And the second step is that witnessing will become a method to achieve awareness. So these are the three steps: consciousness, witnessing, awareness. But where we exist is the lowest rank: that is, in unconscious activity. Unconscious activity is the state of our minds. Through consciousness you can achieve witnessing, and through witnessing you can achieve awareness, and through awareness you can achieve "no achievement." Through awareness you can achieve all that is already achieved. After awareness there is nothing; awareness is the end. Awareness is the end of spiritual progress. In awareness you lose the witness and only witnessing remains: you lose the doer, you lose the subjectivity, you lose the egocentric consciousness. Then consciousness remains, without the ego. The circumference remains without the center. This circumference without the center is awareness. Consciousness without any center, without any source, without any motivation, without any source from which it comes – a "no source" consciousness – is awareness. So you move from the unaware existence that is matter, prakriti (nature), towards awareness. You may call it the divine, the godly, or whatever you choose to call it. 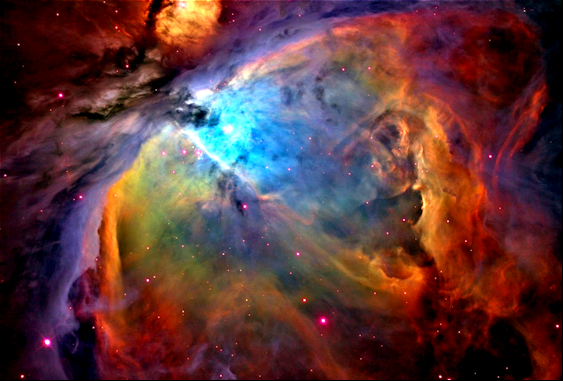 Between matter and the divine, the difference is always of consciousness. "You can't look at This, You are already looking from That!"